11 Oct You can BEE the Change this Week! We are living in a complicated world. I keep trying to swear off listening or watching the news. I try to maintain balance by either regularly walking in my garden with my cat Buddy, or working in a garden or…writing about gardens! This week is a wonderful opportunity to combine your love of gardening with a great cause. We are celebrating our 9th annual Bulbs for Breast Cancer fundraiser. We want to sell TONS of bulbs because during this weekend only, 10% of all bulb sales will be donated to After the Storm, a local non-profit group that assists cancer survivors. You may remember 5 years ago I made a bulb bra and modeled it at their Art Bra event. This summer, my staff made another bra and it raised over $700. Breast cancer touches all of us in some way, it is certainly in my family. 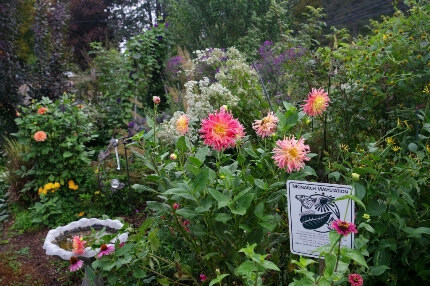 This fundraiser is a great way to donate money AND to have a beautiful garden in 2019. 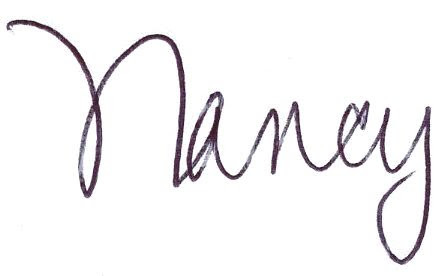 We label our bulbs with the month of bloom, noting whether they are fragrant, deer resistant, and other features. Because we plant 1000’s of bulbs each year, we really know how they perform in CT.
Did you know that planting the earliest late winter and spring blooming bulbs is critically important for our native bees? 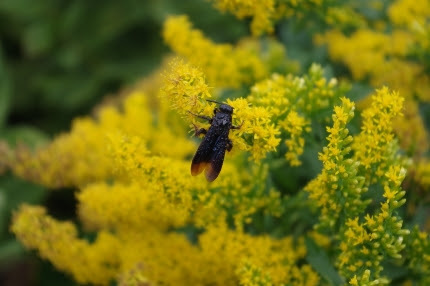 They fly earlier and at colder temperatures than honey bees. The earliest bulbs provide them with much needed pollen and nectar. Which bulbs are the earliest? Well, why don’t you come to my FREE workshop this Saturday morning at 10 am- Designing for Color with Bulbs from February thru July. I will not only explain succession of bloom with bulbs, I will guide you through planting tips and placement. Did you know that garlic is a bulb? Each garlic clove becomes a head of garlic. At 11:30 I am offering a FREE workshop on How to Grow Great Garlic. 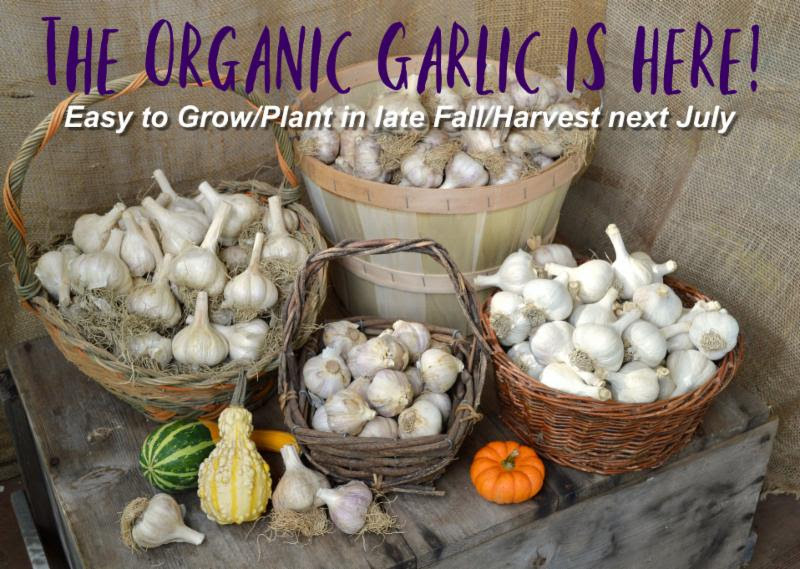 ALL of our organic, hardneck seed garlic is here. This is such an easy crop to grow. You plant it this fall and harvest it in July of next year. How else can you BEE the change this week? Plant lots of October and November blooming perennials for pollinators. Everywhere I walk in the Natureworks gardens, our flowers are covered with pollinators of every shape and size. The same is true at home. I am simply astounded by the life that organic habitat gardens will support. This week, our sales change, but I convinced Diane that we should keep our asters on sale for another two weeks because they are SO IMPORTANT for late pollinators and for migrating monarchs. We are also adding Solidago (goldenrods) to the 20% sale. We carry many kinds that bloom at different heights. They are deer resistant and most tolerate quite a bit of shade and aren’t fussy about soil. BEE the change and plant ornamental goldenrods for our precious pollinators. They are such an important genus. All goldenrods are now on sale 20% off! It’s not only native plants that are important to our pollinators. As I wander our benches I see bumblebees deep in the heart of monkshood (Aconitum) flowers. 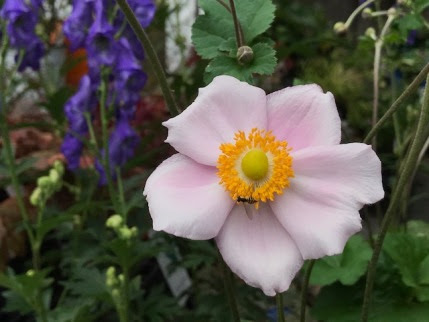 I see tiny beneficial wasps on the Anemone ‘September Charm’. 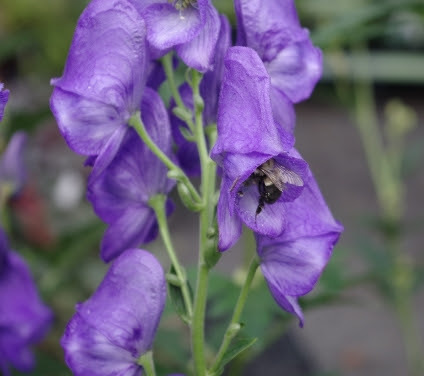 Bumblebees pollinate monkshood flowers by diving deep into the heart of the blossom. up and let the crown be covered with leaves. 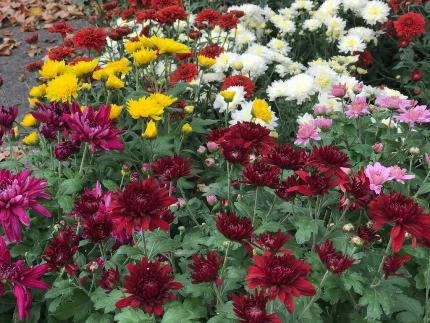 Mums are shallow rooted, and those planted now need a bit of extra protection the first year to root in. After that, you will be doing what I do each spring- dividing them and moving pieces to new areas of your yard. I do the same with my beloved asters. poisons applied in the spring will kill them. Of course, dogs and cats don’t wear shoes, so they will absorb any poisons you apply right in through their paws. We are having the best fall I have ever seen to plant grass seed. Fall is so superior to spring for any kind of overseeding or lawn renovation. 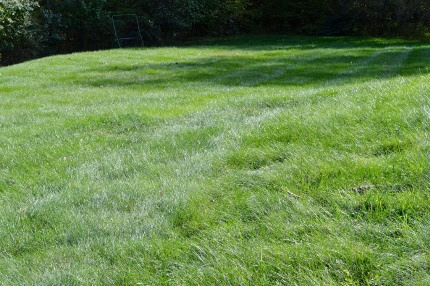 We have everything you need, including two excellent lawn seed blends, organic compost and fertilizers to establish a strong underground root system. It just never gets old. 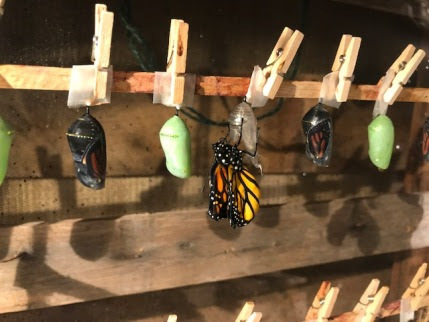 Three monarchs emerging from their chrysalis the other morning in our hatching box. Don’t worry, their wings have to unfold, expand, and dry for many hours before they can fly. are late to hatch and may not make it to Mexico. Monarch Watch has been answering that question as well. Do not worry! This is what they say: “Stragglers, or monarchs that do not make it to Mexico, are a normal part of the survival strategy for the monarch species as a whole. Imagine what would happen if all monarchs behaved the exact same way at the exact same time, but the environment suddenly changed. Think of the variation in behavior as an insurance policy. Should we be upset when some do not make it when others do? No, because that variation is a sign of a high-functioning system.” The best thing YOU can do is make sure you have put out the welcome mat as they migrate through CT. Sunday and Monday I had lots of migrating monarchs in my yard and they were on the ASTERS. They flew from aster clump to aster clump. 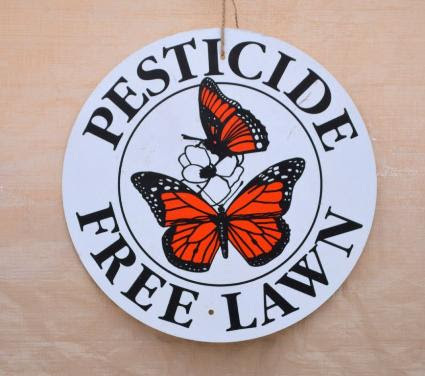 Natureworks is a Monarch Waystation and you can be too. Asters galore, Eupatoriums, dahlias, zinnias, and Echinaceas all provide important food that they need to make the 3000+ mile flight to the sanctuary in Mexico. I spent many hours at my computer over the weekend, preparing my class for the October 20th all day seminar Solving Design Dilemmas. Karen Bussolini and Christine Froehlich, the other two teachers, are presenting classes that will feature tons of before and after pictures of projects they have designed. Karen will focus on designing without a formal drawn plan, what she calls an intuitive approach. I will then explain the HOW of garden renovation, a very timely topic for this time of year. That is what I was working on all weekend. I bounced back and forth between renovating an existing garden in my yard and then working on my presentation at my desk about what I had just done. I urge you to download the flyer and register today. The class is almost full. It is going to be really quite the day of learning, Click Here. In my class on October 20th, I will share with you some of my favorite plants that belong in every garden. 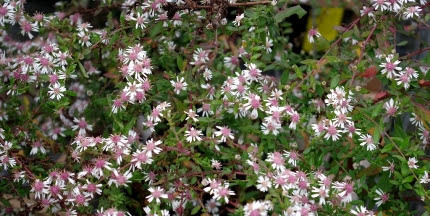 Included in my list is Aster ‘Lady in Black’. It is just a wonderful perennial all season long AND it is just blooming now. having a fall flower arranging class with Leslie Martino, a new Natureworker this spring is an expert floral designer and a judge for the Federated Garden Clubs. 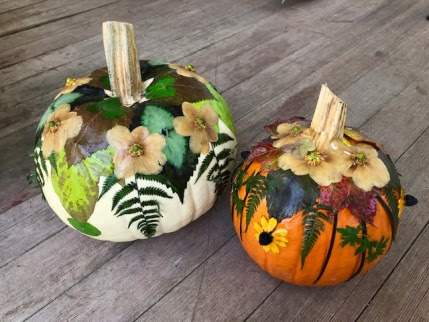 We are offering a Pumpkin Planting and Trick or Treat Treasure Hunt for kids on October 27th, and an exciting new crafts workshop Decoupage Botanical Pumpkins as well. Click Here to go directly to our website and register on-line. It couldn’t be simpler! So don’t get overwhelmed by the current events. Let the garden be your healer, your source of peace and relaxation. 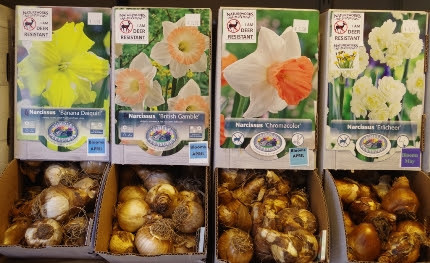 Stop in this weekend and stock up on bulbs and make your bulb buying dollars go to a good cause. Keep on planting so that you too can say at this time next year “I have the most amazing October garden ever!”.